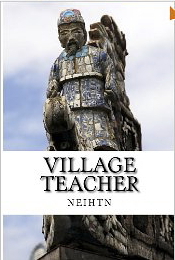 Village Teacher is my first novel. I started it in 2008 and finally published it in May 2012. It took that long because, for most of the time, I could only write or do research in the evening and on weekends. Not being tied to any deadline allowed me the luxury of procrastinating and doing research and rework whenever I thought it was necessary. On the whole though, the story took shape in my mind toward the end of the first year, and from then on it was a matter of having enough time and patience to let the words flow out and the story take shape. The novel’s chapters followed one another in an almost natural order, and I did not have to go back and add or delete any significant amount of material. After the initial draft, I did have to move some parts around to make the story easier to follow. Toward the end, I spent quite a bit of time struggling with formatting the book, first for the print version and then for the Kindle version. Why did I write? One reason was because the examinations system in Việt Nam, even in its modern forms, had always been such a large part of everyone’s life, including those who never took part in any examination. Many years ago, I read Lều Chõng [Tents and Pallets], a novel written by Ngô Tất Tố in 1952. In it, the author described how the main character took part in one of the last examinations under the Nguyễn dynasty at the beginning of the 20th century. I thought the ending of that novel was rushed, as if the author ran out of time and had to hurry to meet some publishing deadline. When I started Village Teacher, I noticed on my bookshelves a copy of Vietnam and the Chinese Model by Alexander Barton Woodside in which there were several chapters that dealt with the examinations system. Subsequently, I also found works by Nguyễn Thị Chân Quỳnh, Khoa cử Việt-Nam in two volumes published in 2002 and 2007. They described in even more minute details the organization of the mandarinate examinations and the more salient historical events and characters that took part in them. With such background materials, I decided to write Village Teacher keeping modern and younger readers in mind, especially the young Vietnamese who, after 1975, either lived or were born in Western countries where their parents fled after the collapse of South Việt Nam. It’s my way of introducing them to a little bit of Việt Nam’s history and culture. Hopefully, more than 100 years after the last mandarinate examinations were held in Huế, this book will allow them an interesting look at a way of life that even their parents or grandparents may only be vaguely familiar with. However, the book also has a broader appeal than just the Vietnamese diaspora. After all, it is a love story set in a historical era when East meets West, often with calamitous consequences for the former. It is an easy read and the story will get most people keenly interested in its main characters. Some readers have told me that they stayed up late at night to read it to the end. This may explain why other Asian and Western readers of Village Teacher have enjoyed it as much as my fellow Vietnamese. For those who are interested in reading the book, it is available on Amazon in both print and Kindle versions. “I read this book without knowing a lot about the history of the French colonization of Vietnam and I thoroughly enjoyed it. The characters are well-drawn, the prose is sparse and to the point and suits the story very well. I would have no hesitation in recommending this book to anyone who enjoys historical fiction.” Michael Kenny, August 16, 2014. “I thoroughly enjoyed this delightful and well written book. The author is a gifted story teller. I hope he writes more books.” Thomas C. Heuerman (Minnesota), August 4, 2014. I recommend this tender, historical love story set in Viet Nam during the French colonization without reservation!! I loved it! !” Judith Ann Lovell, review published November 4, 2013 on Amazon. I thoroughly enjoyed Village Teacher, from the gentle tone of the storytelling to the tender love story and interesting historical facts.” Nicua Shamira “Shamira” (Perth, Western Australia), review published July 17, 2013 on Amazon. I shall purchase this and look forward to reading it. Thank you! I hope you will enjoy reading it and find it worthwhile. Please let me know what you think of it, or, if you like, post your own review on Amazon. Thank you so much! Please let me know your impressions once you have read it.